Combine flour, sugar, cornstarch, baking powder, salt, and spices in a large bowl; reserve. Whisk pumpkin and eggs in a medium bowl. Add milk, oil, and vanilla to pumpkin mixture and whisk until blended. Add pumpkin mixture to dry ingredients and stir until smooth. Preheat waffle maker. Pour about 1 cup batter onto the center of the bottom grid. Close top and flip waffle maker. Bake until brown, about 4 to 5 minutes. Serve with Honey Ginger Butter (see recipe below). Combine butter, honey, and ginger in a small bowl. Refrigerate until ready to serve. 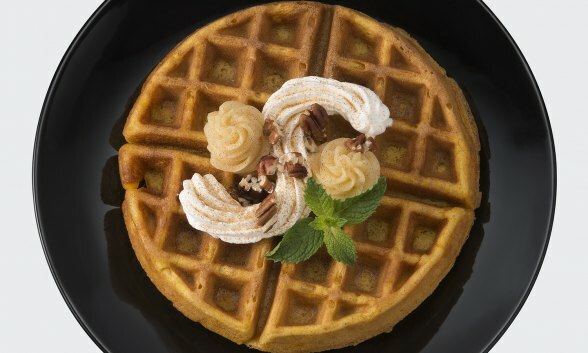 Click here for more information on quality Presto® Electric Waffle Makers.